While we are programmed to say “Bless You” to people around us who sneeze, we may not be programmed to do what we actually need to do. That is, back up…way up and fast! Researchers have uncovered some staggering statistics about the common sneeze and cough that warn us all to take action! It is pretty common knowledge that coughing and sneezing spread germs, but you will be amazed at just how far contagious germs can travel. Researchers from the University of Bristol assessed the survival of airborne bacteria contained in aerosol droplets from coughs and sneezes. How far do contagious germs in a sneeze really travel? Amazingly contagious germs are able to fly through the air at an alarmingly high rate of speed. 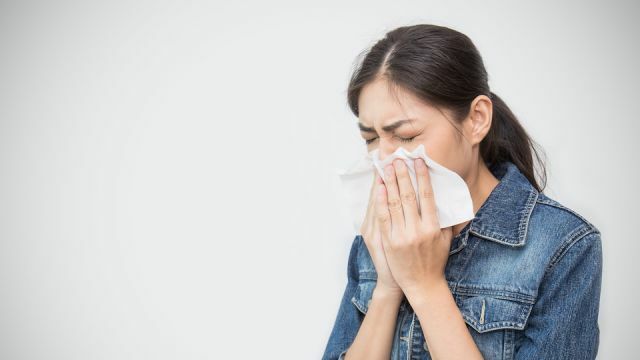 Researchers found that the average sneeze or cough can transport 100,000 infectious germs through the air at a speed of up to 100 miles per hour. These germs contain viruses including influenza, respiratory syncytial virus (RSV) and adenoviruses, which cause the common cold. Not only that, but they also carry bacteria, such as Streptococcus pneumonia or Haemophilus influenzae. According to researchers, the first few minutes after a sneeze or a cough is when the germs are most likely to spread, and spread fast. Study author, Allen Haddrell, Ph.D. expresses that the droplets are so small that they can penetrate deep in the lung. Although aerosols that carry germs will eventually make their way to the ground, it can take some time. This recent research revealed that each droplet has about 20 bacteria in it. When it comes to viruses including colds and the flu, it takes about 1,000 to cause an infection. What this means is that 50 droplets would need to be inhaled for you to be at risk. This is not difficult to do if you are standing in the line of fire of sneezer or cougher. Keep a scarf handy – A scarf can work two ways. If you have a cold, keep a scarf handy to sneeze or cough into. This protects those in your presence from being contaminated. If you are not sick, keep a scarf handy to protect yourself from those that are. Wash your hands – Keep your hands washed, especially during cold and flu season. Make sure that you scrub your hands for 30 seconds and be sure to wash thoroughly between your fingers and under your nails. Wear a mask – If you have a weakened immune system or are a little sick yourself, you may wish to wear a mask when in public. A face mask will protect others as well as yourself from fast-flying bacteria-laden sneezes and coughs. Keep the lid closed at home – When at home, always close the lid to your toilet before flushing. According to Haddrell. It is easy for bacteria to enter the body via your nose, eyes, and mouth. When you are out in public or have been around someone who is sick, be sure to avoid putting your hands near your face, which encourages the spread of possibly dangerous bacteria.